The L train shutdown plan has arrived. This afternoon the MTA and DOT released the contours of their plan to keep people moving during the 15-month L train outage west of Bedford Avenue, while the MTA repairs tunnels and tracks damaged by Superstorm Sandy. It’s the first real public showing of a replacement transit service plan since Gothamist broke news of the L shutdown nearly two years ago. The L train disruption will affect hundreds of thousands of daily transit trips, including 50,000 along 14th Street in Manhattan alone. The agencies are counting on increased subway service on the J/M/Z and G trains to handle 70-80 percent of displaced L passengers. But for riders in Manhattan and along the western L train stations in Brooklyn, other subway routes are not a good option. For these riders, the agencies will beef up travel options by bus, bicycle, and ferry. The outline released today includes substantial transit- and bike-priority treatments, especially on 14th Street. 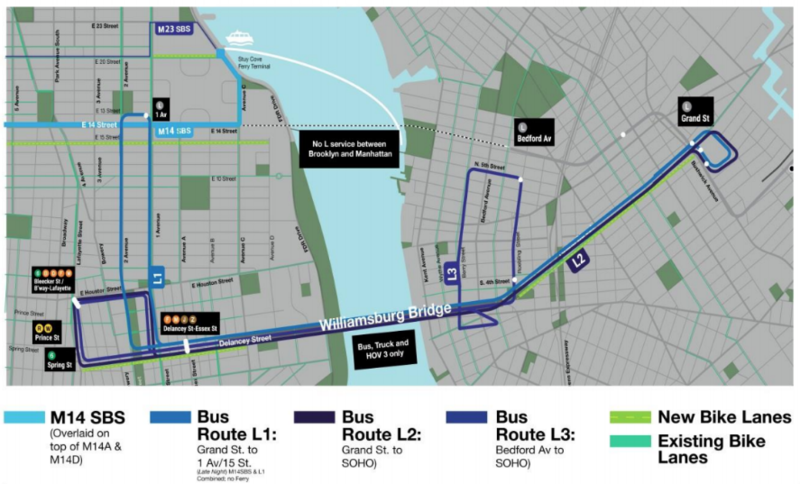 While the plan also calls for bus priority on the Williamsburg Bridge approaches, the details are less specific. Overall, there’s a lot to like in the plan, but it still relies heavily on a straining subway network to carry most of the load. Advocates are not convinced the agencies are doing as much as they should to make bus service fast, reliable, and capable of carrying large numbers of people. Here’s a short review of what we know so far. Streetsblog will publish more detailed analysis in a forthcoming post. The bus service plan calls for three shuttle routes connecting North Brooklyn and Manhattan. Two of those routes will have a terminus at Grand Street — one connecting to 14th Street and First Avenue, the other to the Delancey Street, Spring Street, and Bleecker Street subway stations. A third route would connect the vicinity of the Bedford Avenue L stop with those three subway stations. The agencies are expecting 3,800 passengers per peak hour on the shuttle services. DOT says fare payment will be the same as Select Bus Service routes, so it looks like ticket-vending machines will be installed on sidewalks. Combined, these routes will move 70 buses per hour across the East River during peak times, with target end-to-end travel times of about 25 minutes. To keep bus service from getting bogged down in traffic, the city will install bus lanes approaching the Williamsburg Bridge on Grand Street, Delancey Street, Kenmare Street, and Allen Street. DOT says it is looking “to make major changes” to Grand Street as a “major bus and bicycle corridor,” but stopped short of the full car-free “PeopleWay” Transportation Alternatives has called for. The bridge itself, meanwhile, won’t have bus lanes but will be limited to vehicles with three or more passengers — and trucks. Adjusting the bridge configuration to add more bus priority would be a relatively easy course correction if it turns out to be necessary, however. The outer deck of the Williamsburg Bridge will be for bus, truck and right turns only. (HOV3s will be directed to the outer deck if they wish to turn right at Clinton St, and trucks aren’t permitted on the inner deck.) The bus lanes on the approaches will feed directly into the outer deck, and the HOV3 rules will make the outer deck work reliably for bus passengers. A new M14 Select Bus Service line will run from the Stuyvesant Cove Ferry Terminal at East 20th Street down Avenue C and across 14th Street, terminating on the West Side Highway around Horatio Street. For 14th Street itself, DOT opted for a bus- and local delivery-only street with expanded sidewalks on the busy central section. Eastbound 14th would be only for transit and deliveries from Ninth Avenue to Third Avenue. Westbound it would be from Third Avenue to Eighth Avenue. Conventional bus lanes would also extend east to First Avenue. DOT will also make two blocks of Union Square West car-free pedestrian zones (between 14th Street to 15th Street and between 16th to 17th). The block of University Place between 13th and 14th would also be pedestrianized with a new bike parking hub. Instead of including protected bike lanes on 14th Street, as some advocates had hoped, DOT is planning a two-way protected lane on 13th Street. The agency says other bike connections are in the works, but those are not detailed in today’s release. Good to see the proposed plan for Manhattan shares the joy 14th St will experience with some other streets in the neighborhood. Suggestion: eliminate on-street parking on one side of West 12th St to ease ambulance access to the medical facility on the old St Vincent’s site. It’s also good to see yet another 2-way bike lane proposed for 13th Street. Two-way bike lanes should be standard. Two-way bike lanes legitimize real-world daily use, and the 2-way bike traffic discourages pedestrian incursions. Days when I need to commute through Court Square every other week are going to become hell on earth. SBS tickets on these routes is also going to a nightmare. Either make them free or pilot some new fare payment. Fingers crossed there is more detail to come here. What happened to the larger HOV plan Kabak reported on a month ago? Fake news? This is pretty consistent with the document Ben obtained, which was an agency memo produced sometime over the summer or early fall. There’s a more specific commitment to bus lanes on the bridge approaches in this official release, which is good to see. Though it’s not quite clear how those bus lanes will be laid out. That was one of three scenarios. The other two scenarios only involved the Willy B. IIRC the memo made it seem like the city was shying away from the HOV-on-all-bridges option. In any case, adding HOV limits on other ERBs would be pretty easy to set up with little advance planning if needed. The city did stuff like that in short order after Sandy hit. Just insane that they aren’t coupling this with a Congestion Pricing/E. River tolling plan. Such amateurism. I guess you’re more optimistic than I am on this. This seems like a safe middle ground politically, but this is the bare minimum investment for those of who have to use transit in this city. How is HOV3 going to be enforced? The city can’t even keep drivers out of the bus and bike lanes throughout the city. I’m hoping that this pushes our electeds further in that direction. The next gen payment system should start on these routes that cross 14th and the Wburg Bridge. This isn’t the first HOV lane in the tri state area; e.g. the HOV3 lane in Staten Island/Brooklyn and the HOV2 lane on the LIE. On a purely anecdotal level I think drivers follow the rules regarding the occupancy requirement for the most part, since cops pretty aggressively and regularly ticket those who don’t. I’m hoping that MTA/DOT left room for improvement and that we can extend the HOV (or add tolls) to a few more bridges. If not, they’ll just be pushing traffic uptown. Agreed, really nice to see that they closed the West Side of Union Square to traffic. That was part of DOT’s original plan but it was struck down by the CB. Glad to see it come back. And closing the block of University Place from 13th to 14th is super smart. Cyclists naturally go south there anyway and there really wasn’t a choice. Where would the cars have gone when they hit 14th Street? Next step is turning University Place into a true share street! I wonder how wide that two-way PBL will be? The bus lanes and HOV restrictions need to be for much more than weekday rush hours. 6am-midnight weekdays at minimum, 24/7 ideally. From the map, it looks like 2 lanes, each 5′ wide, with a 3′ protective bufer strip with bollards separating the bike lanes from cars & trucks. I think the 2-way PBL on 13th St is a WIN for the forces of good. They need to have plenty of enforcement for sure, but also they need to make the fine very high, and potentially add points to the licenses of violators. Curious if this is a done deal or if it has to go through the community board dog and pony show? 13th street redesign is great news for my bike commute once it happens! No chance of getting doored on 10th street anymore! Thanks for everyone who advocated for this, it really makes my life better. Cyclists naturally go south there anyway and there really wasn’t a choice. The current BAD southbound choice from 14th St is Broadway. A better southbound choice from 14th St would be to make the existing protected bike lane on 4th Av / Lafayette St two-way. People are concentrating on the surface transit changes and ignoring how the MTA is treating the 80% of L-Train riders they expect to continue to use the subway. At present there are 20 packed tph between Brooklyn and Manhattan. That means they must plan for an additional 16 tph (80% of 20) between Brooklyn and Manhattan. Which services will account for these 16 additional trains? They are augmenting G-Train service to 600′ trains and 4 minute headways. These don’t count because the G does not go into Manhattan. The G-Train may serve as a feeder but it needs something in which to feed. Two new free transfers are proposed to the 3 and 7 Trains. However, no additional service is planned for these lines. Moreover none is likely. Service is limited by the number of available trainsets. There are not enough available trainsets to operate the existing peak schedule. None are in the pipeline. Debugged R179’s will not fit on the 3 and 7 lines. These new transfers are hollow gesture that will benefit only a few riders. Additional JMZ service is promised with an unspecified number of trains. How much additional service is possible? Peak hour uptown F/M Train service is now 22 tph. This leaves room for an additional 8 more uptown M trains whether they terminate on 2nd Ave or in Queens. This also brings the number of trains crossing the Williamsburg Bridge to 26 tph. This number would equal the 1954 service level. However, this is the maximum service level that can be expected. The constraint isn’t signals or terminal capacity; it’s the Williamsburg Bridge’s live load capacity. If the signal system were the limiting factor, only 30 tph could be accommodated on the Williamsburg Bridge. That would raise the number of extra JMZ trains from 8 to 12 or from 50% to 75% of what is required. It’s taken the MTA 23 months to come up with a mitigation plan that handles 50 to 75% of the anticipated problem. But does it work? I’ve never used the HOV lanes during the hours of operation. and they seem to be full of single occupancy drivers off peak. The aggressive enforcement is news to me, but in this case the entire bridge will be HOV, so you can’t just drive in and out of it. I assume some L-line trainsets will become free during the shutdown, whats the chances of using those on other lines ?? Not that I’m an expert on the vagaries of NYC subway car deployment. People are going to start picking up hookers in order to use those lanes. There are 3 car sizes: 51’x9′; 60’x10′ and 75’x10′. The numbered routes, like the 3 and 7, require the 51’x9′ variety. Currently approximately 5% of peak scheduled trips on the 1-6 numbered routes (and the 42nd St Shuttle) must be cancelled due to lack of available trainsets. There are no purchases pending for additional 51×9′ trainsets. The 60’x10′ trainsets can operate on any any lettered route, with the exception of the 42nd St (S) shuttle. The 75’x10′ trainsets can operate on most lettered routes. The exception being the JMZ and L routes. The other complication is train length. Most routes can accommodate 600′ long trainsets. The exceptions are the JMZ and L routes which can handle only 480′ long trainsets. There is an order for 270 cars that would comprise 32.5 480′ trainsets and 4 600′ trainsets. Delivery is 2 years late and initial deliveries have failed acceptance tests. Here’s a link to current and previous car assignments. Off-peak the HOV restriction is not in effect. On peak, whenever I take the lane I’ve never seen single occupancy vehicles, personally. A link to this please, if it’s out yet? I want to know how the bus lanes would look like in Manhattan besides 14th Street. Transit riders came out in force yesterday for a rally on 14th Street calling on the MTA and DOT to raise the bar in their L train shutdown plan. As the L train shutdown approaches and the deadline for a detailed plan of action from DOT and the MTA draws closer, the de Blasio administration is hesitating to take the necessary steps to prioritize buses and high-occupancy vehicles. The three-month window gives the agencies time for some trial-and-error on 14th Street before the tsunami of displaced L train passengers hits. There's a lot to like in the preliminary outline from DOT and the MTA, but if the agencies don't get the details right, transit riders are in trouble.